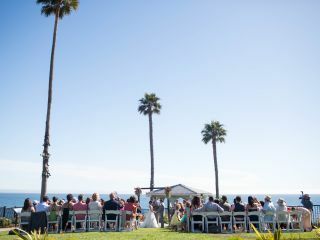 Begin your new life together in a picturesque oceanfront setting by planning Central Coast weddings with Martin Resorts. Stunning vineyards meeting sparkling waves, setting up an idyllic backdrop for your most significant celebration. Our flexible wedding venues in Central California are suitable for both intimate and grand celebrations alike. Whether you are planning an intimate wedding ceremony, a bridal shower, a grand wedding reception, or vow renewal, our Central Coast wedding venues, allow our expert planners to assist with choosing the right venue and taking care of every last detail so you can enjoy your day, including flowers, music, catering and more. 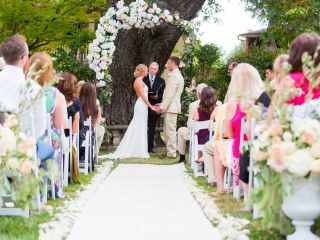 California coast weddings can take place indoors or outdoors, from an enchanted garden in Paso Robles Wine Country to a beachside soiree in Avila Beach. Read below to learn more about our wedding venues on the Central Coast. Located midway between Los Angeles and San Francisco, our coastal California hotels offer a variety of Central California wedding venues to accommodate both large and intimate gatherings. Explore our many options below. Whether you are interested in an intimate wedding ceremony directly on the sand or you wish to exchange vows on our romantic oceanfront Sun Deck, we will help you plan a memorable and unforgettable event. Our flexible space can accommodate both large and small groups of up to 110 people. Nestled in between rolling green hills and the beautiful serenity of the Pacific Ocean, Avila Lighthouse Suites provides an unforgettable backdrop for your special wedding day. Contact our Event Sales Manager at 805-627-1900 or by email at weddings@avilalighthousesuites.com. Can you think of a more romantic setting for your wedding than Paso Robles Wine Country? Paso Robles Inn is a unique and historic choice for an unforgettable wedding ceremony, reception or bridal shower. Our Central California wedding venues include a grand turn-of-the-century ballroom and beautifully landscaped gardens complete with a decadent fireside patio reception, a Koi pond, and a babbling brook. Contact us at events@pasoroblesinn.com or 805- 226-4927. Room blocks are also available, with some suites offering private spa tubs. Let the professional staff at Ventana Grill help plan the oceanfront wedding of your dreams. Perched at the water’s edge, overlooking the beautiful Pacific, Shore Cliff Hotel is ideal for an outdoor oceanfront wedding ceremony and reception to follow in Ventana Grill’s indoor oceanfront ballroom. 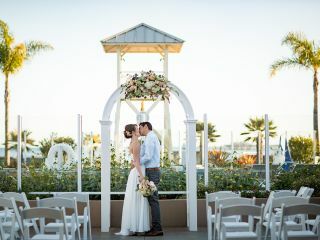 We offer an oceanfront gazebo and lawn area located overlooking the scenic bluffs of Pismo Beach, the oceanfront Pacific Ballroom overlooking the Pacific Ocean for dramatic wedding receptions and the Ocean View Pacific Room, which can accommodate up to 150 people. Please contact their Events Department at 805-556-3641 or at email events@ventanagrill.com.